Above: Photos from last year’s Town Hall. Calling our Lower East Side neighbors! We want to hear from you. Please join Henry Street for our annual Town Hall and breakfast meeting on Sunday, September 16, 2018, from 10:30 a.m. to noon at 301 Henry Street. Community members are invited to join share their feedback on neighborhood needs and concerns with our team members as well as learn more about our programs and services. RSVP online here or call 212.766.9200 x2231 for more information. More information can be found here. 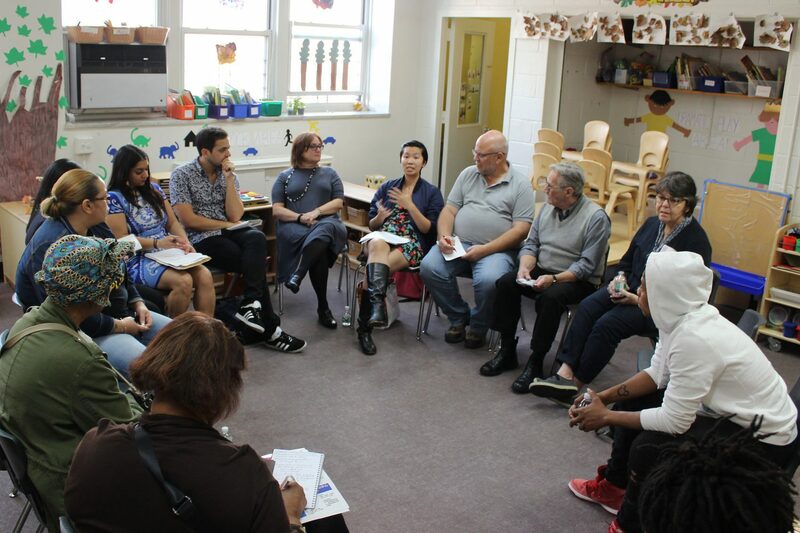 Each year since 2014, Henry Street has engaged a growing number of community members in discussing topics of interest, including housing and gentrification, education, and police-community relations. Summaries of our past findings are available on our website. After the Town Hall, please join us in celebrating 125 years on the Lower East Side at our FREE 125th Community Day birthday block party from noon to 5 p.m. in neighboring Sol Lain Public Park. This once-in-a-lifetime celebration will feature food trucks, street fair attractions, games, vendors, workshops and performances, a special guest DJ, and more! More information can be found here.